Bodegas Faustino is one of the best-known names of Rioja, the distinctive frosted bottle for their ‘Faustino I’ Gran Reserva having taken on iconic status. Though rooted in Rioja, this family-owned and run company has in fact developed into ‘Grupo Faustino’, with a surprisingly diverse range of bodegas and wine labels within its portfolio. Not only are there the classic Riojas, ‘modern’ Riojas aged in French oak (‘Faustino de Autor’) and Cavas under the Faustino brand, but they also own several other Spanish bodegas including Campillo and Marqués de Vitoria in Rioja, Valcarlos in Navarra and the giant Leganza in La Mancha. Perhaps most intriguing of all is their Ribera del Duero property, Bodegas Portia. Pictured right is Don Julio Faustino Martinez, president of the group. The Faustino Martinez family have been acquiring vineyard land in Ribera de Duero since the 1990s, and now have 160 hectares planted with Tinta del Pais, the local synonym for Tempranillo. The first vintage of Portia Ribera de Duero was in 2003, and since then a premium wine called Portia Prima, made from a selection of the best grapes and barrels, has been added. A new entry-level wine has just been launched, called Portia Ebeia, which will retail for around £7.99. Tasting notes on the current releases of all three wines follow. I visited Ribera del Duero in summer 2010 as one of a small group of wine, travel and architecture journalists, who were the first to be invited to see the new winery that has just been built for Portia. Finishing touches are still in progress, and the winery will be opened officially by King Juan Carlos in the autumn. The winery has been designed by Foster+Partners, one of the UK’s most high-profile firms whose previous commissions include Wembley Stadium and the ‘Gherkin’ building at 30 St Mary Axe in London. Architect and Partner in Foster+Partners, Pedro Haberbosch, met us to talk us through this building. He joked that Norman Foster’s wife’s Spanish nationality was important in the firm winning this commission, and revealed that many of his team involved in the project worked two harvests at Portia to really understand the wine making process. The winery is almost entirely constructed of four materials that are intrinsic to the wine making process: steel, oak, glass and concrete. It is a trefoil design, with each of the three legs housing one part of the winemaking process: grape reception and fermentation in the first, barrel ageing in the second and bottling in the third. The facility will have an annual production capacity of one million bottles. 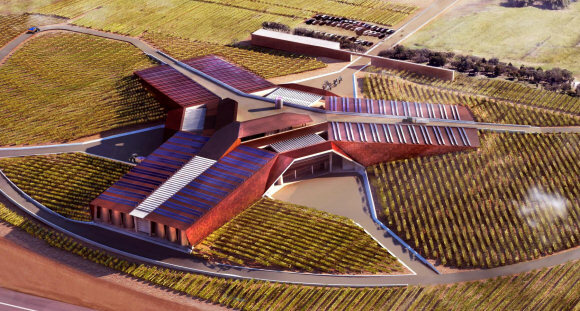 The exterior of the building is clad in huge, rusted steel ‘shingles’ that match the reddish soils of the area, and grapes are delivered by driving up onto the roof of the winery, so that everything can then move through the winemaking process by gravity. 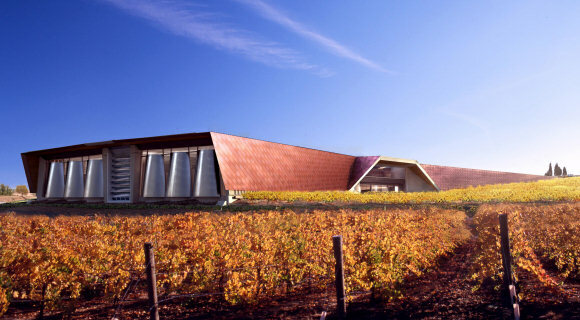 Internally, a glazed central core houses blending tanks, and a walk-way around it has little spurs that jut out and above each of the legs, allowing visitors direct connection with the winemaking process. Although functional and quite minimalist, the building slowly works its charms on the visitor. It sits beautifully in the landscape and there is a subtle magic in the atmosphere that emerges as you move through each of the cavernous spaces. The building is partially underground, taking advantage of the steeply sloping site, and details include little windows set in long rows at ground level which glow with an unearthly red light to mark the change from overground to underground. The roof, a series of hundreds of concrete ribs, acts like a huge heat sink to moderate external temperatures. The winery has been commissioned at an undisclosed but obviously considerable sum as part of Faustino’s 150th anniversary celebrations since it began making wines in 1861. It is intended to be a major visitor attraction in this regions too (where many wineries are closed to the public) with extensive facilities including an upmarket restaurant. In terms of the wines, it is early days and the vines are still young, but my guess would be that Faustino sees their top Portia cuvées as one day competing head to head with Ribera del Duero’s elite like Pesquera, maybe even Vega-Sicilia and Pingus. This is the first wine to made in the new winery. Its name means ‘small hill’, and the label is reminiscent of a topographic map – and the rings of a slice of oak. 100% Tinta del Pais, it is aged four months in America oak. Tight, firm aromas of tightly-wound black fruit with lightly charry but more liquorice edges of oak. Small glimpses of something more fragrant. Tight, glossy, firm palate too, the fruit staying firm and the tannins quite grippy and spicy. There is a good acidity here, in a fresh, confident style that is dry and food-friendly. I think this will ease-out a little (it was only bottled in April and this tasting was in June) and the fruit will come through a little more, but it has good structure. 87/100. Around £7.99, not yet in the UK at time of writing, but see any current stockists on wine-searcher. 100% Tinta del Pais again, spending 10 months in American oak, but compared to the Ebeia it is leafier and more lifted, with some herbal character but a beautiful cherry fruit and a boldness. Racy palate, with the fruit fresh and breezy and its inherent crispness offset by creamy tannins and good acidity. Not a big influence from the American oak, just a nice charry background, but staying very juicy and delicious. 90/100. Around £12.99, see all stockists on wine-searcher. From their best vineyards, where the selection of the best grapes is made in the vineyard. Fermented and aged in new French oak (only 100 barrels made), this is an undeniably massive wine, with copious sweet black fruit layered with spices and smoky, charry notes, hints of violet and chocolate. The palate has similar weight and heft, the huge sweetness and depth of the black fruit flooding across the tongue, with rolling, creamy texture and dense, ripe and plush tannins. It’s a big, delicious wine, the balance fine with good acidity and the smooth, creamy texture pushing through into a long finish. 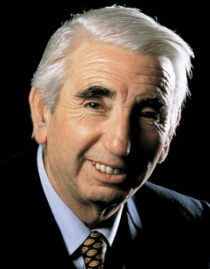 91/100. Around £19.99, see all stockists on wine-searcher.